This year we are traveling the world in geography. Our main focus, however, is the United States. So, when we were given the opportunity to review Big IQ kids we were thrilled! Big IQ kids is an award winning online program recommended for grades K-8. They offer both free and premium programs in spelling, vocabulary, math, and US States. We found all the programs very easy to use. Our main focus was on the premium US States but both Stephen and Sarah used the math and spelling a few times too. Each lesson only takes about 10-15 minutes to complete and the child is not advanced to the next level until they have obtained mastery in the level they are working on. On several occasions, I would receive an email after they finished their daily lesson stating the error that had occurred and a helpful tip to help them the next time. Spelling & Vocabulary: Here you will find a word dictionary with over 40,000 words. 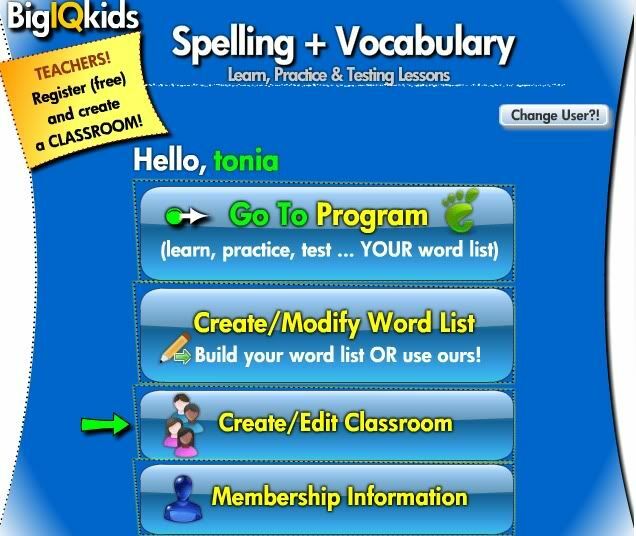 They have programs pre-loaded with 40 lessons for K-adult appropriate word lists or you can easily enter your own word lists and the program will automatically create a week’s worth of lessons, quizzes and tests around your own lists. The program includes tracking and progress reports. You can purchase a premium membership to Spelling Jr for $7.99/month or $39.99/annual. Math: Here you can set up a child's lesson to mirror what they are doing in their current curriculum. 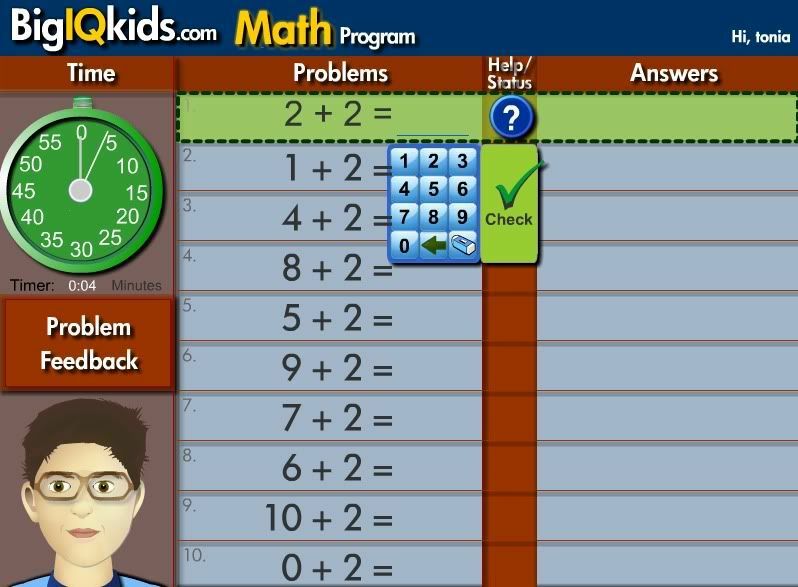 For example, if the child is on double digit addition and single digit multiplication, the program can focus on just these two areas. You can purchase a premium membership for $9.99/month or $49.99/annual. 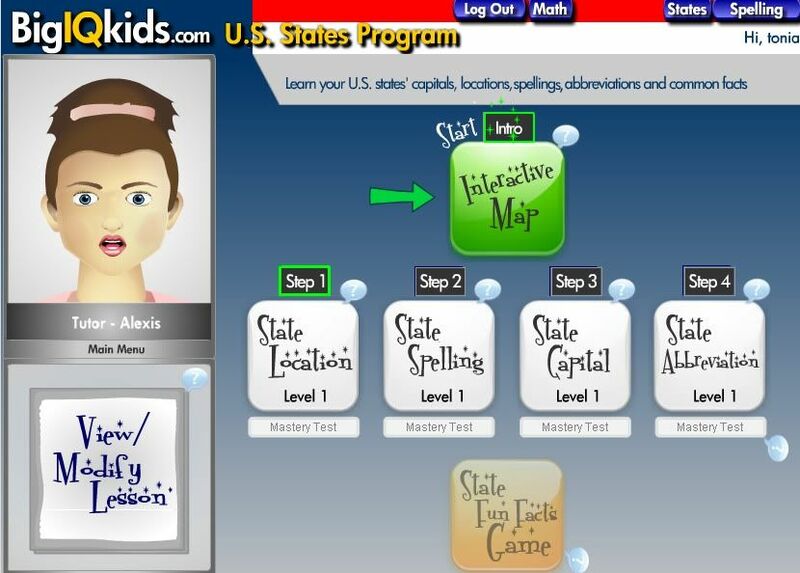 U.S. States: BigStatesTime is the ultimate tool in learning the state's location, capital, spelling, abbreviations and general state facts. The program allows parents/teachers to add additional facts which will be included in the child's lessons and the program culminates in a “State Mastery Exam” that, if passed with 100% mastery, awards the child a State Master Certificate. You can only purchase an annual premium membership for US States and the cost is $39.99. A monthly membership in US States is not available. All of the lessons can be customized to level and liking. Big IQ kids allows the children another avenue for learning and adds in the fun factor. Both Stephen and Sarah really enjoyed this program. After completion of the daily lesson, they each had the opportunity to play a game from the game page so with that kind of reward they were begging for more :). For a detailed comparison chart of the free versus premium memberships go here. Here they are enjoying one of their daily lessons. The Big IQ buddy that you can create when you sign up has a very robotic voice that just loved! Overall, we really enjoyed Big IQ kids. Is this something we would purchase to add to our curriculum? No, but I could see how it would come in handy for lessons on the go! Don't forget to check out what my fellow crewmates thought of Big IQ kids.